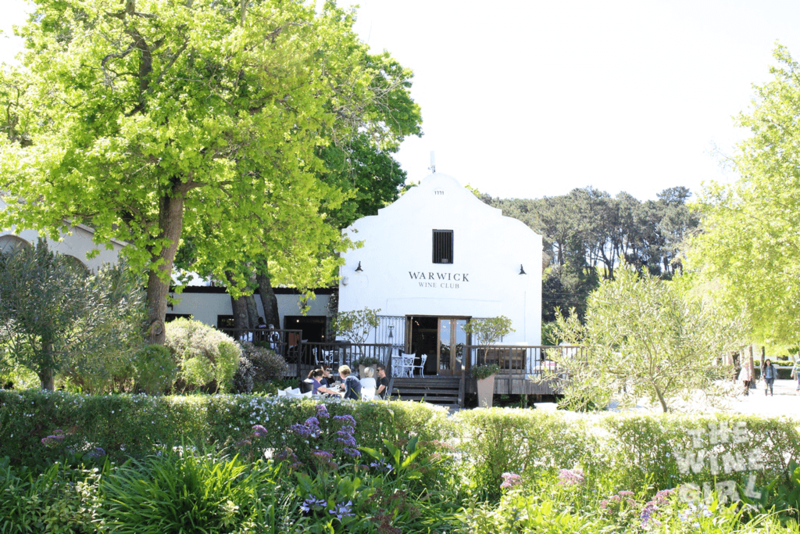 Meet wine farm number 20 of 800 – Warwick in Stellenbosch. #DoStellies. It is child friendly however, I do not recommend this venue for kids between the stages of toddler to 6 years. 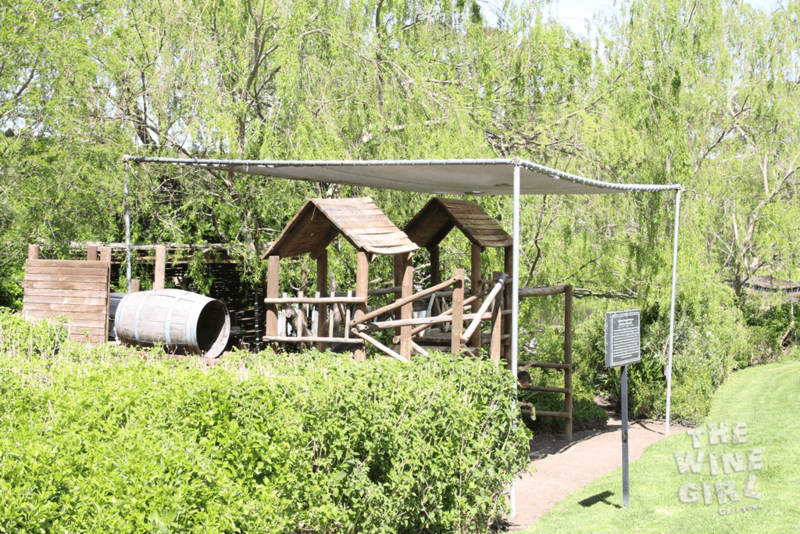 There are jungle gyms which are out of site of the tasting room, so only bring your kids if you intend on doing a picnic. Also book in advance to get a picnic spot that is close to the jungle gym. Big 5 Safari (land rover trip up the mountain with 5 wine tastings each paired to a big five animal). You wont actually see the animals. Guys, this farm is VERY popular. Ensure that you book well in advance to avoid any disappointment. Click here to view the options. You can go in the Summer or winter months. Winter: They serve an a la carte menu inside and there is a cosy fire place. Summer: even better! 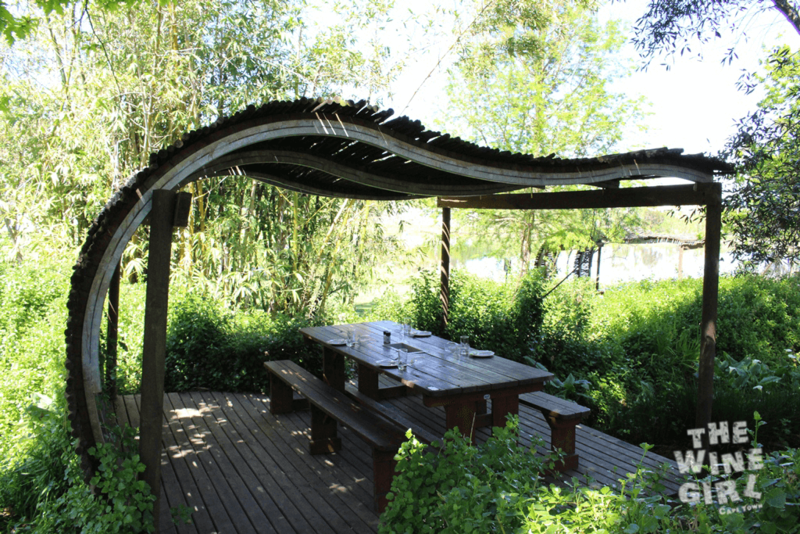 Enjoy a picnic on the green lawns overlooking the lake or the private picnic pods. Favourite time to go: I would recommend September/October/November months when it is not too hot or windy. Take the N1 and then the R44 turn-off towards Stellenbosch. Click here for the Google map. For more information on Warwick, view the contact details by clicking here. This is the tasting room. You can sit outside or on the terrace. I would recommend sitting outside on the terrace if it is a lovely day. 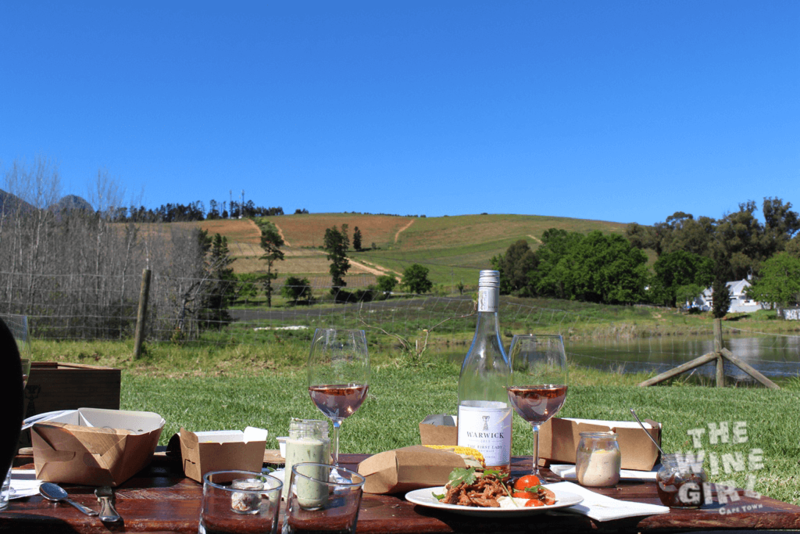 Do some wine tasting in the morning and then a picnic in the afternoon. Four people is the ideal number for me. If you are six, you must book the comfy lounge chairs that you can see at the front of the terrace. You can do a standard or exclusive tasting for R35 or R50 each. The service was really good quality – not fast though so be aware of this up front. Each tasting has a story behind it and the staff are so good at telling the stories. So be prepared to make a whole day of it at Warwick. I would recommend starting at 10am and do the tasting for 1-2 hours, sit back and enjoy listening to the stories. Don’t rush anything. Then move on to the picnic areas for lunch. 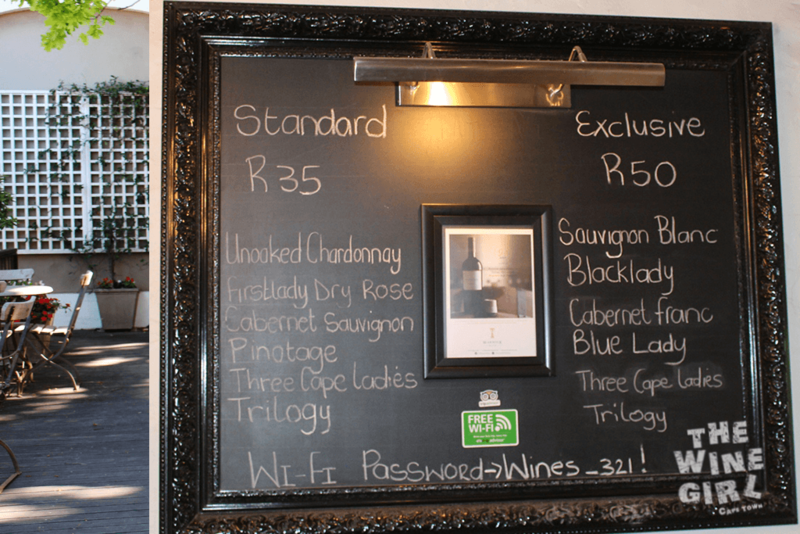 You will notice that most of the wines are called either “The First Lady”, “The Black Lady”, “The White Lady”, “The Blue Lady” or “The Cape Ladies”. So what is up with all these ladies? Well, that is quite a story. 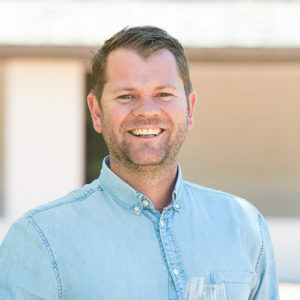 I don’t want to ruin too much of the story telling experience for you but let’s just say that most of the wines are named after a very special people. 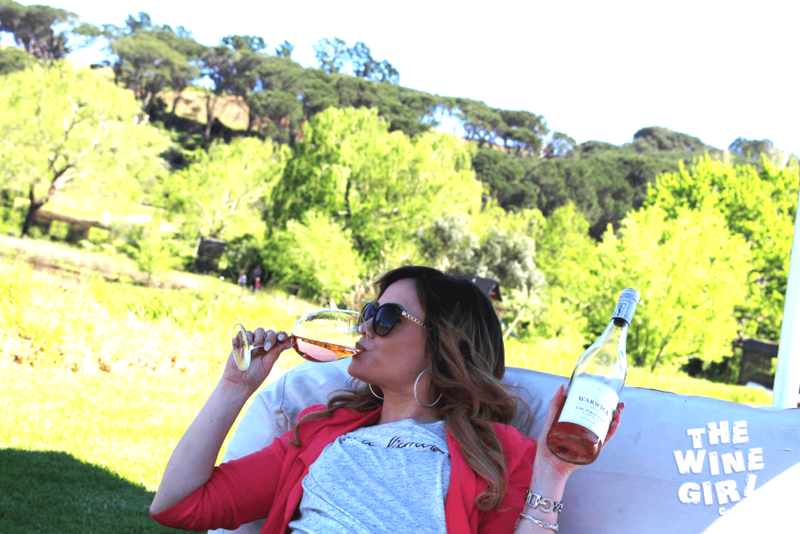 First up to taste was The First Lady Dry Rosé at R80 a bottle. It is made from Pinotage and is incredibly refreshing. Delicately pink, bursting with pomegranate, strawberry and watermelon. Bone dry, yet soft with good acidity. 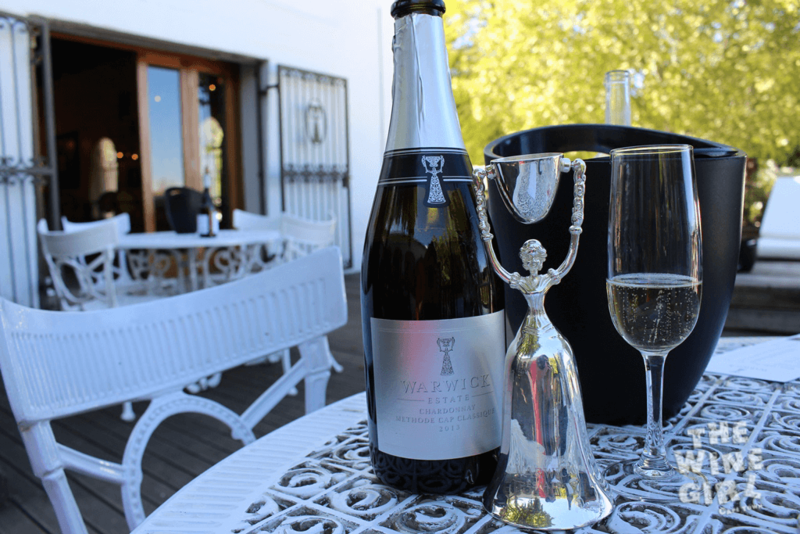 In 1984 the first Warwick Cabernet Sauvignon called ‘La Femme Bleu’- the Blue Lady – was released. 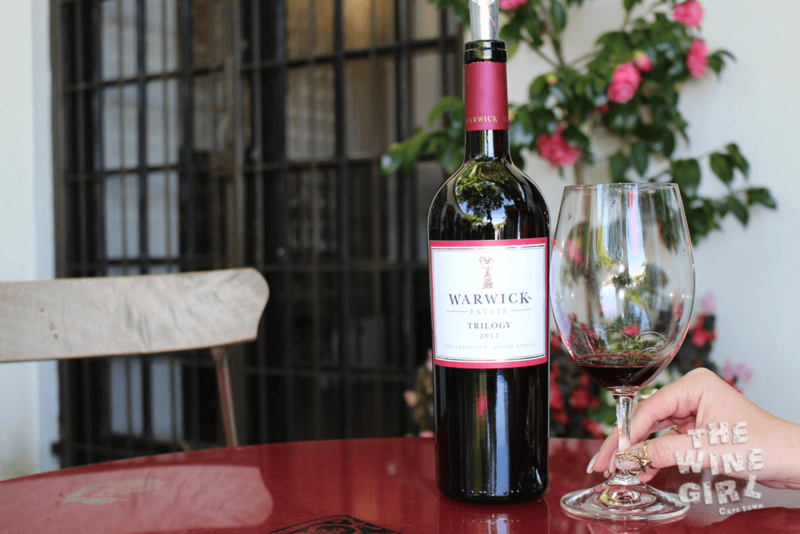 The winemaker had a natural talent for making great wines and in 1986 (the year of my birth, how fitting) Warwick Trilogy was released, a Bordeaux style blend which has since become a flagship of the South African Wine Industry. It was marvelous! Black cherries, thyme, origanum, marjoram, milk chocolate, pencil shaving, graphite, wild raspberries and mulberries is what you will experience on the nose. It is a blend of 56% Cabernet Sauvignon, 30% Cabernet Franc and 14% Merlot with 26 months in French oak barrels. Incredibly fruity, dry and smooth. I loved it! R350 a bottle. Sold! This is the White Lady and the Black Lady Estate wines. 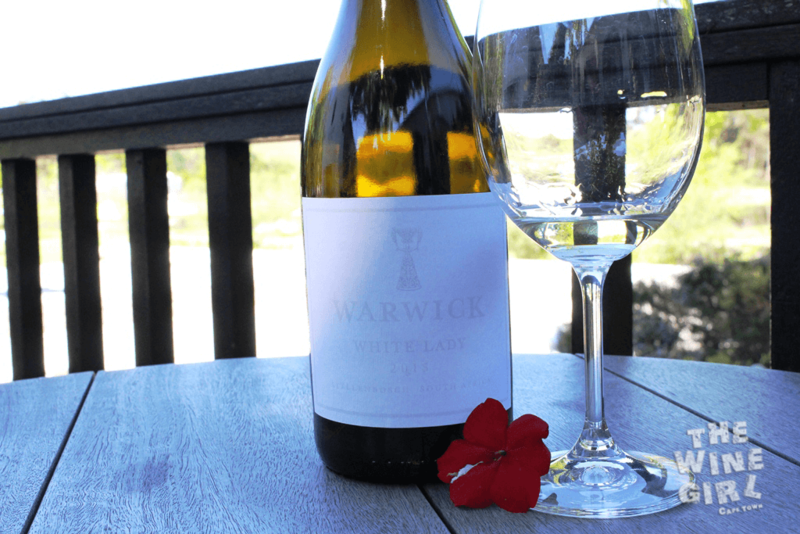 The White Lady 2014 vintage (sold out, boo) was the ‪#‎Platters2016‬ ‘White wine of the Year’ winner. If you like classy oaked Chardonnay you’ll be delighted by this wine. R300 a bottle. 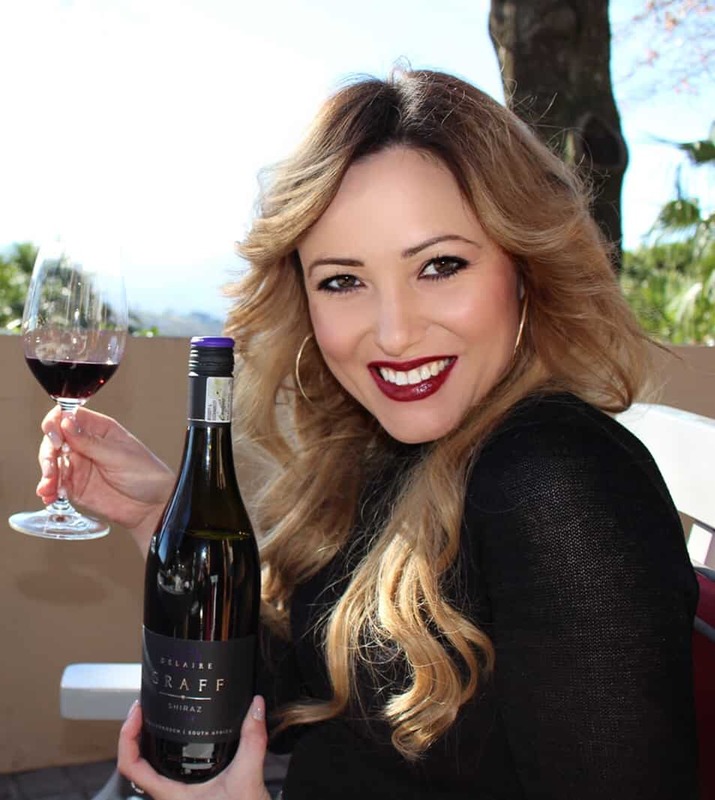 The Black Lady is R275 a bottle and has plummy characteristics which open up and reveal white pepper, cloves and floral aromas to create an aura of mystery to tantalize your taste buds. As you have guessed by now, it is a Syrah (Shiraz). Incredibly dry with a spicy finish and you can smell Fynbos. The colour of the wine is outstanding. Do you love Chardonnay? The First Lady Unoaked Chardonnay was incredibly light yet it had depth and good flavor. Breathe in deep and you with pick up fresh lemon zest on the nose. Fantastic for summer with lots of ice. 👌 R80 a bottle and should be enjoyed with a lemon herb, freshly grilled line fish. This was another very interesting wine for me with a great story. 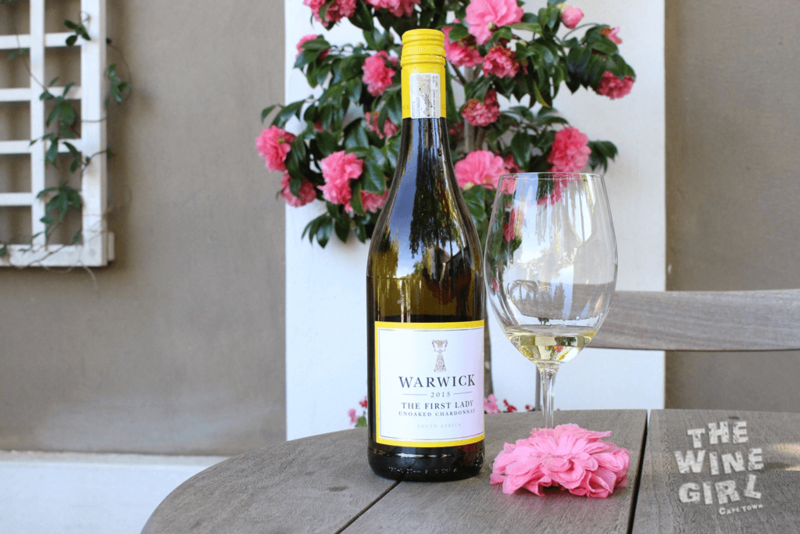 It is called the Warwick Professor Black Sauvignon Blanc and was named after the professor who looked after the peach trees which used to grow on the farm. There are still some trees which grow on the farm yet they are there for memory and are not harvested. You will smell PEACH when you open this wine. Incredible! R110 a bottle. Because there are so many wines to taste, each glass is given a very small serving to taste as you can see in the photos. It will literally take you one or two sips to finish. I would have liked a bigger serving so that I could get a better taste for the wine. I liked the big glasses though. After the wine tasting, we moved onto the picnic area. We were escorted to our spot and were asked what we would like to drink with the picnic. We opted for the Rosé to go with the salmon salad. As you get comfortable, and within minutes, they return with your wine and picnic – all very well presented. They actually unpack the picnic box and explain each of the components. Excellent. You will find things like biltong paté and salmon salad in your picnic box. A freshly baked bread and even dessert! Click here to learn more about the picnic options. It is R500 for two people but we were three and found it sufficient. What a great view! I was lucky with perfect weather. These are the picnic pods if you are more people and prefer a table. This would come in handy if it is windy. And here is what the jungle gyms look like. There is a picnic pod right next to it which would be ideal for families with school going children. Just look at that green green grass! Another view of the tasting room. This is the wine shop. They have many bottles and different wine goodies including the wedding cup, aprons and glasses. If it is chilly outside, they have an indoor tasting room which looks like this. There is a fire place on the far wall.